Berkshire Hathaway is the investment firm from billionaire Warren Buffett. It was once a textile company founded back in 1839. In 1962 Warren Buffett started to acquire shares of the company until he had ownership of it. However, as Warren Buffett would later notice, Berkshire Hathaway represented the worst investment he’s ever made. Although he kept the company, which over the years would start investing in many other businesses (Coca-Cola, Heinz, Geico and many others) and became the investment holding for Warren Buffett‘s investments over the years. What salary do Warren Buffett and Charlie Munger get? Does Warren Buffett manage the whole portfolio? Does Warren Buffett look at market fluctuations? Has Berkshire Hathaway always been successful? There was a time when Berkshire Hathaway was a manufacturing company, from Rhode Island. The company, founded in 1839, was born as the merging of several manufacturing companies over the years by the 1950s Berkshire Hathaway was a successful manufacturing company, which suffered from the decline of the textile industry. During the 1960s, young Warren Buffet set to make money out of Berkshire Hathaway stocks. However, he never made money from those operations. In fact, from a CNBC interview Warren Buffett clarified that Berkshire Hathaway was the worst deal he ever made. Claiming to have lost $200 billion. As the story goes, Warren Buffett was ready for a tender offer which he agreed with the management. Yet that agreement was not respected, which made Warren Buffet angry until taken aback from the anger he acquired the control of the company and fired the man – Mr. Stanton – to whom he had agreed on the tender offer for Berkshire Hathaway. Since he had committed most the investing money in Berkshire Hathaway, Mr. Buffett kept holding at it. In the meanwhile, he also entered the insurance business, within the next twenty years. In short, Berkshire Hathaway became a burden that would never scroll from Warren Buffett‘s shoulder, not just from a philosophical standpoint. But instead from a financial perspective. As reported by Warren Buffett had he entered directly the insurance business, rather than the textile, based on compounding earnings Warren Buffett would have earned $200 billion more. Of course, talking at conditional is not a good investment strategy. 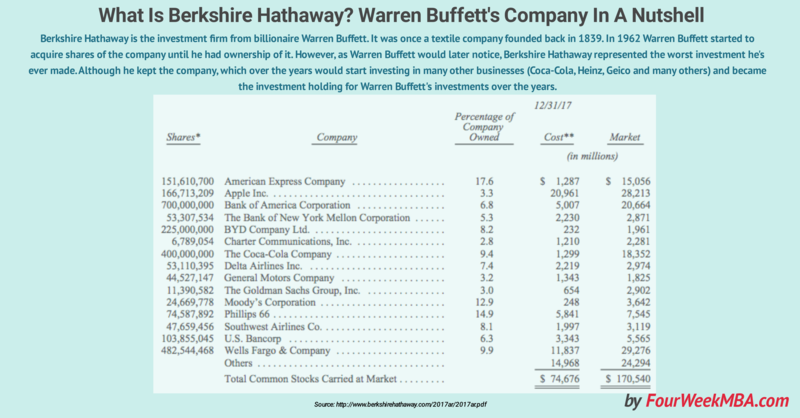 The paradox is that Berkshire Hathaway, Warren Buffett‘s first and worst investment also stuck as the name of the investment company that later in the years would acquire brands like Coca-Cola, Geico, Goldman Sachs, Apple and many others. Berkshire Hathaway is owned by Warren Buffett, Charlie Munger, Bill Gates (founder of Microsoft), David Gottesman (founder of First Manhattan Co.) and others. While as individual shareholders Warren Buffett is the one who owns more than 5% of Berkshire Hathaway class A stocks. At the institutional level, Blackrock owns 7.7% of the company and The Vanguard Group has 9.2% of the company, both in class B stocks and State Street Corporation owns about 6.3%. Those ownership percentages are as of March 2018. Like Alphabet ownership structure (known as Google), also for Berkshire Hathaway, we have to make a distinction between ownership and control. Berkshire Hathaway stocks are divided into two classes: A and B. If you look at the shareholders for Berkshire Hathaway, you might notice how Warren Buffett, between Class A and Class B stocks, might have voting power for more than 50%. However, as reported on the Proxy statement, “Mr. Buffett has entered into a voting agreement with Berkshire providing that, should the combined voting power of Berkshire shares as to which Mr. Buffett has or shares voting, and investment power exceed 49.9% of Berkshire’s total voting power, he will vote those shares in excess of that percentage proportionately with votes of the other Berkshire shareholders. When a company decides to issue equity in the form of common shares, it can do so in several types depending on the limitations that the owners of the company want to give to voting powers and also in terms of ownership. In short, a Class B stock might be worth more Class A stocks. As of the close of business on March 2018, Berkshire Hathaway has issued 748,347 shares of Class A Common Stock and 1,344,969,701 shares of Class B Common Stock. Each share of Class A Stock is entitled to one vote per share. Each share of Class A Stock is convertible into 1,500 shares of Class B Stock at the option of the shareholder. Class B Stock is entitled to one-ten-thousandth (1/10,000) of one vote per share on all matters submitted to a vote of shareholders of the Corporation. Warren Buffett and Charlie Munger get a salary of $100,000 per year. This is a base salary, as they don’t take bonuses or any other form of compensation. From the table, you can see how today Berkshire Hathaway is a well-diversified business that owns companies like American Express, Apple, Bank of America, Coca-Cola, Goldman Sachs, Moody’s, Heinz (not reported here) and many other brands. Among the most successful investments, there is Coca-Cola, which Warren Buffett started to buy back in 1988, until in 2017 that amounted to 9.4% shares of the company. If you follow Warren Buffett, you know how his aversions for tech companies. Yet starting 2016 he started acquiring Apple Inc. stocks. In fact, back in 2007, Warren Buffer set an experiment. On one side an advisory firm, called Protégé selected five “funds-of-funds.” In short, it selected five investment experts, who in turn selected other hundreds of investment experts, each managing a hedge fund. In short, what we would call an “elite crew” of financiers. While Warren Buffett would invest in an index fund. In short, that is a fund that replicates other existing indexes. In this particular case, Warren Buffett “bet” on an index fund replicating the S&P. The main feature of the index fund is the passive management style those have. In fact, an index fund starts from the assumption that you can outperform other managed funds, by simply replicating existing funds. From the table above after the first year, the index fund pretty much outperformed the actively managed funds-of-funds. Intrinsic value can be defined simply: It is the discounted value of the cash that can be taken out of a business during its remaining life. While this definition provided in the annual report is straightforward. In reality, assessing the intrinsic value for an organization is very hard and can be done by looking at it from several perspectives. Warren Buffett has his own way to look at intrinsic value, that while at the beginning of his career was way closer to his mentor, Ben Graham, it changed over the years. For instance, while Ben Graham as value investor pushes to acquire companies when they are cheap. Warren Buffett usually ignored the stock price. Disclaimer: the information provided in this article is for educational purpose only. The financial information is useful to understand a company’s business operations but has nothing to do with stock movements. For investment decisions consult a professional.